WINSTON-SALEM, N.C. — Taking advantage of a second-quarter turnaround, the Clemson Tigers (15-8, 6-4) tallied an emphatic, 69-53, road victory over the Wake Forest Demon Deacons (10-13, 1-9) on Thursday. The Tigers improve to 6-4 in ACC play, the most conference wins for Clemson since the 2003-04 campaign. Picking up their fourth conference road win for the first time since 2001, Clemson shot 44 percent from the floor, including a solid 6-of-11 output from beyond the arc. The Tigers dominated the Demon Deacons inside with 38 points in the paint. Continuing to serve as the spark plug for Clemson, senior Aliyah Collier scored in double figures for the seventh time in the last nine games. The guard tallied 18 points on 8-of-16 shooting and hauled in a season-high 14 rebounds for her second double-double this year. Fellow senior Danielle Edwards also fared well for Clemson going 4-of-5 from distance in a 14-point showing. 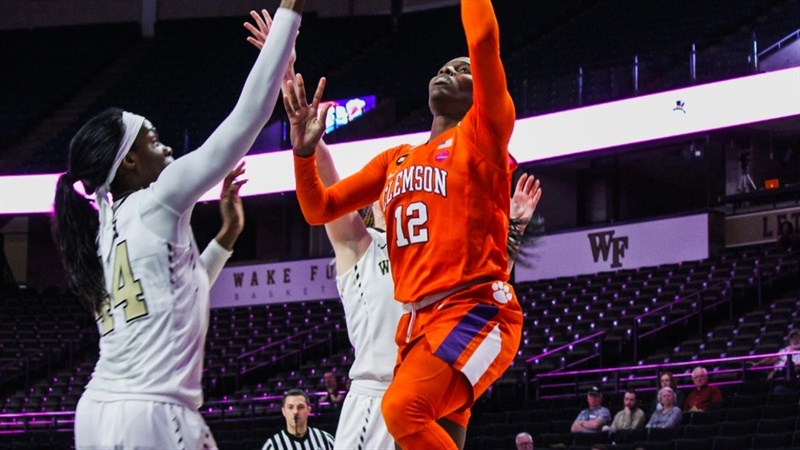 Clemson took control of the contest by way of a 15-0 run that began late in the first quarter and concluded with just over six minutes remaining in the second quarter. A 3-pointer off the bench by Camreé Clegg and quality play by Collier on both ends of the floor set the offensive tone for the Tigers that would continue for the remainder of the game. Leading 35-24 at the half, an Edwards trey kicked off the third quarter as Clemson continued to dominate on the offensive and defensive side of the ball. Shooting 46 percent from the field in the final 20 minutes of gameplay, Clemson coasted to a 16-point triumph. Clemson returns to Littlejohn Coliseum on Sunday afternoon to take on the red-hot North Carolina Tar Heels (14-10, 5-5). Tipoff is slated for 2 p.m., and the game will air on ACC Network Extra. The Tigers will honor the memory of Clemson legend Barbara Kennedy-Dixon at halftime, and the first 200 fans will receive a free T-shirt with her number on the back. All single-game tickets are on sale for adult and youth/seniors at $6 and $4, respectively. Children 12 and under get in free. Single-game and season tickets can be purchased online or at 1-800-CLEMSON. All seats for women’s basketball are general admission. Game Notes: Senior Aliyah Collier finished the game with 18 points and 14 rebounds for her second double-double of the season (10th of her career)...Her 18 points marked the seventh double-figure outing for the senior this season...The guard eclipsed the 800-point mark in her career (814), becoming just the 13th player to record 800 points and 600 rebounds...Additionally, she tallied six steals in the game to set a new career-high...Senior Danielle Edwards finished the night with two steals, moving into fourth all-time for career steals (266)...She surpassed former Clemson standout and coach Itoro Umoh (265)...Clemson defeated Wake Forest for the first time since 2012...Clemson eclipsed the 15-steal mark as a team for the fifth time this season...The Tigers sit at 6-4 in the ACC, the first time that Clemson has reached the six-win plateau in conference play since the 2003-04 campaign...The win over Wake Forest was also the fourth road ACC win of the year, a feat that has not been accomplished since 2001 (five).